There are different forms of financial accounting documents used in making business transactions. Some of them are company specific while others are commonly used in all types of business entities. One such document is the bill receipt. You all must have heard of sales receipts, invoices, and bills. These are all different documents with slight variations only. The basic purpose of all these documents is the same. Record keeping and accounting are the most common reason of these documents. A bill is a document that is presented to a purchaser when he owes money to the seller. It acts as a demand for making the payment. The bill receipt is a proof of that bill. It helps maintain a record that a bill has been presented to the purchaser to make the payment. 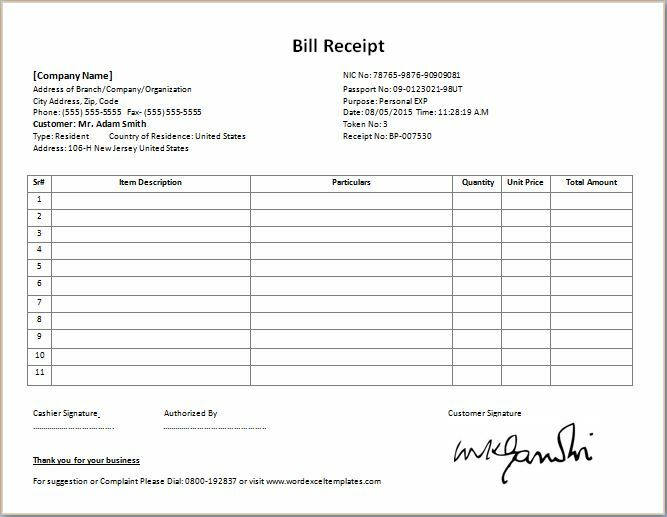 Anyone can draft the bill receipt using the given template that is available to download here. All you need to do is download it and customize it according to your own company’s needs and requirements. 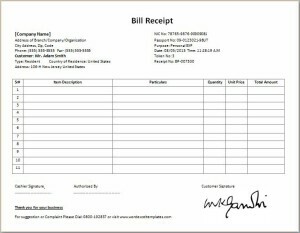 The bill receipt template contains important information and details about the products and service purchase. This information may include a description of the goods bought, their quantity, forms, and prices. You should also mention the date of purchase and location of the store. The company can also mention the mode of payment. Therefore this is an essential document that is used in almost all types of business entities that carry out some sort of selling and buying of goods and services.